Owing to the rapid urbanization, the popularity of internet sales, and increase in pet-product information availability, the pet food sector in Asia grew by 5.54% in 2017 from 2016. Striving to attain the high-income status by 2020 through the Eleventh Malaysia Plan (2016-2020), Malaysia, shows a massive opportunity for the growth of middle-class population. According to the Department of Statistics, Malaysia, the mean monthly household income for Malaysians increased to USD 1,660 in 2016 from USD 1,465 in 2014, with a growth rate of 6.2% per annum. The urban nature of the young people in the country is crucial for the adoption of pets and fulfillment of humanization trends. This trend of pet humanization thereby stimulates the desire for adopting and providing care for the animals. Additionally, due to the anticipated economic rebound, pet owners are ready to spend more money on premium food products for their loved pets. The rising demand from pet owners for more nutritious, healthy, and organic food for their pets and increasing adoption of private label brands in the country are significant factors driving the Malaysian pet food market. Malaysian pet welfare societies, such as the Paws Animal Welfare Society, Penang Animal Sanctuary Society, Penang Animal Welfare Society, SPCA Penang, and SPCA Selangor, have been spreading awareness by posting videos and images of stray cats and dogs through the social media, encouraging pet adoption. 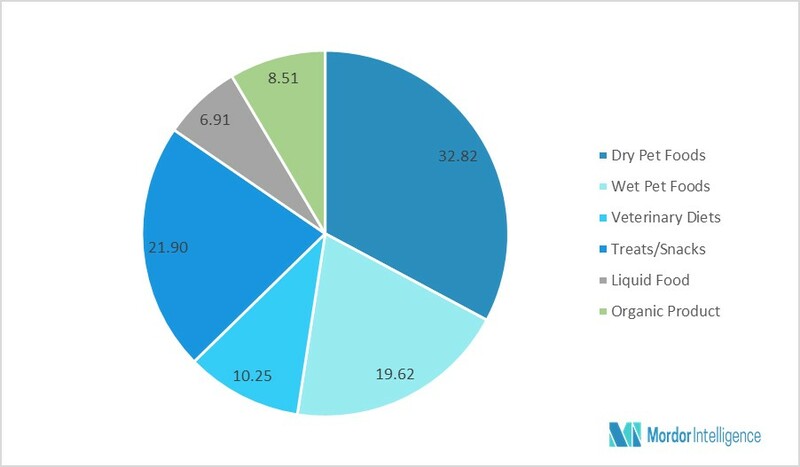 The Malaysian pet food market has been segmented by product, pricing, animal type, and sales channel type. Organic products are the fastest-growing segment, owing to the high health awareness among pet owners. Cat food is a significant segment, regarding market value, although high dog adoption rates are expected to propel the dog food market at a faster CAGR in the next five years. Although more than 80% of the Malaysian pet food market is dependent on leading global players, the Malaysians are now ready to consider locally branded products of good quality. The international players, such as Mars Inc., Nestle Purina, and Hills Pet Nutrition, reign over the pet food market in the country, and have an advantage from the extensive distribution through hypermarkets, supermarkets, pet shops and pet superstores. Lazada, a popular e-commerce company in Malaysia, started out with 30,000 products in 2012, and grew to six million in 2017. This shows that the adoption of e-commerce is accelerating and the online environment is flourishing in the Malaysian market. The index of the use of prepared foods in Malaysia is often quite low, indicating that many pets are still being fed on table scraps, and thus suggesting a vast potential for expecting the high sales growth rate to continue. Major Players: NESTLE, MARS INCORPORATED, CARGILL, WELLPET, DIAMOND PET FOODS, COLGATE PALMOLIVE AMONGST OTHERS.